With a mixture of reflection and awe, the writer evokes the night of Christ's birth, recalling not only the birth but also its meaning: the Christ who is born in Bethlehem is our Savior and our King! Parish priest Joseph Mohr (b. Salzburg, Austria, 1792; d. Wagrein, Austria, 1848) wrote the original German text in six stanzas in Oberndorf, Austria, on December 24, 1818, for St. Nicholas's Church. Because the church organ had broken down that day, Mohr and his parish organist, Franz Gruber (b. Unterweizberg, near Hochburg, Austria, 1787; d. Hallein, near Salzburg, Austria, 1863), composed this beloved hymn to be accompanied on guitar for the Christmas Eve service. After organ repairman Karl Mauracher heard the hymn, he took the manuscript to the Tyrol region. 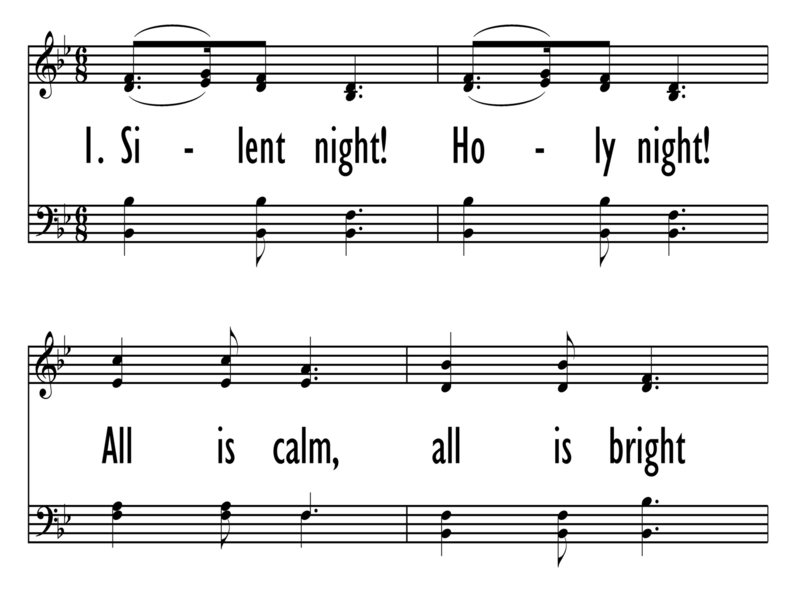 Because it was sung by various Tyrol folk groups (including the touring Strasser "sisters" and the Rainer family), "Silent Night" became known as a “Tyrolean carol.” The hymn's widespread use enhanced its popularity throughout Europe and North America during the middle nineteenth century. Without attributing the hymn's composition to Mohr and Gruber, the Leipzig Katholisches Gesang-und Gebetbuch first published the hymn in 1838; because of the efforts of Gruber's grandson, the author and composer were soon recognized. Various English translations abound, some of which are rather free paraphrases. The popular English translation, by John F. Young, first published in John C. Hollister's Sunday School Service and Tune Book (1863). Although he composed nearly one hundred works, Franz Gruber is remembered for only one–the tune of "Silent Night," composed on Christmas Eve, 1818. He scored the tune for tenor and bass soli (sung by Mohr and Gruber on that night) with the final phrase to be repeated in harmony (sung by the village choir girls); the singing was accompanied by guitar. In 1854 he wrote an account of the history of "Stille Nacht, heilige Nacht," accompanied by a score (dated 1833) for two solo voices, chorus, organ, pizzicato strings, and two horns. STILLE NACHT is a pastoral tune in the style of a landler or Austrian siciliano (slow waltz). The tune is intended for gentle singing with light accompaniment (recall its historic performance on guitar). The harmonization is mainly the work of Carl Reinecke (1910). Sing in four parts, perhaps unaccompanied. Or you may want to try only two-part singing (soprano and alto) for some stanzas. Try using a flute or recorder descant; there are many published settings for these instruments. 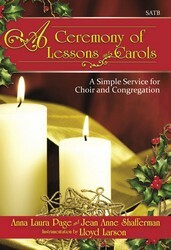 In smaller worship settings try guitar and flute or recorder. Or have children sing some stanzas in alternation with the Congregation. Sing in two pulses per bar. Author Joseph Mohr was born into a humble family–his mother was a seamstress and his father, an army musketeer. A choirboy in Salzburg Cathedral as a youth, Mohr studied at Salzburg University and was ordained in the Roman Catholic Church in 1815. Mohr was a priest in various churches near Salzburg, including St. Nicholas Church. He spent his later years in Hintersee and Wagrein. Gruber was born into a linen weaver's family and studied violin and organ even though his father wanted him to work in the family business. In addition to serving as parish organist for St. Nicholas Church in Obendorf, he taught school in nearby Arnsdorf (1807-1829) and Berndorf (1829-1833). He spent the balance of his career as organist and choir director in Hallein, where he founded the famous Hallein Choral Society. In the small, quiet town of Oberndorf, Austria, on a snowy Christmas Eve, a priest and an organist wrote what is now the most beloved Christmas carol world-wide. Stories abound as to the exact circumstances of the hymns origin, and there are societies dedicated to the task of protecting the authentic hymn text and story. If you ever visit Bronner’s Christmas Wonderland in Frankenmuth, Michigan, you can visit a replica of the Silent Night Chapel. Movies and operas revolve around the hymn, and almost every recording artist that has ever made a Christmas album has recorded it. In a sense, this spreading of the Word is a joy. But these honors should also make us wary. Paul Westermeyer writes, “Partly because of its popularity, STILLE NACHT can easily point to itself rather than beyond itself to the Word” (Let the People Sing, 153). It is important, then, to not simply listen to what we might consider a quaint, nostalgia-evoking carol, but to sing out the depth of these words. For the “dawn of redeeming grace” is something far greater and grander than any song we could ever write.